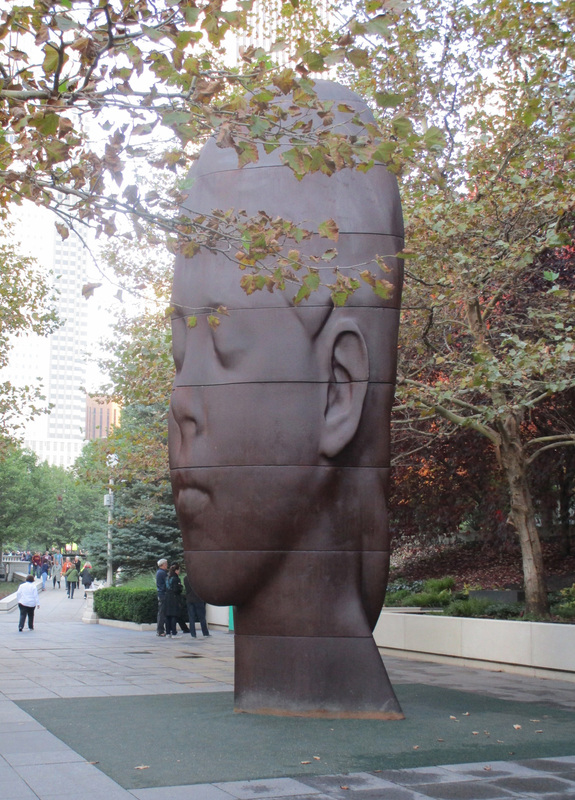 It’s Chicago’s Year of Public Art, so let’s get out and experience some of this creative art. I was always aware that Chicago has a great tradition of making public art available to all, and its collection of public art is one of the defining characteristics of the city, but this special year gives another dimension to this. 2017 has been designated Year of Public Art Chicago, with a new 50×50 Neighborhood Arts Project. 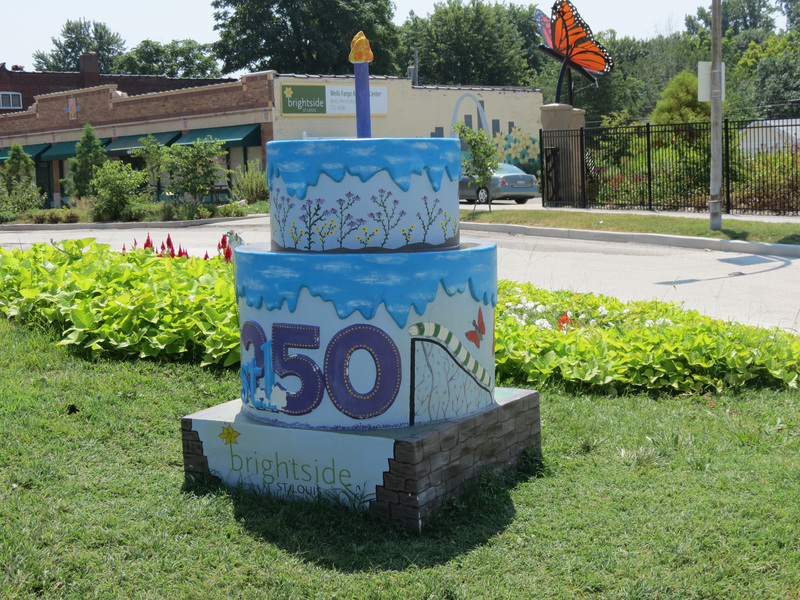 Managed by DCASE (Chicago Department of Cultural Affairs and Special Events), the 50×50 initiative will provide up to $1 million for new public arts projects. inspired by Chicago’s 50 wards and the 50th anniversary of 2 of Chicago’s most famous seminal public art works: The Picasso in Daley Plaza, and The Wall of Respect, which once stood at 43rd Street and Langley Avenue on Chicago’s South Side. DCASE manages the Chicago Public Art Collection, which includes 500+ works exhibited in over 150 municipal facilities around the city, such as police stations, libraries and CTA station. DCASE also administers the City’s Percent-for-Art Ordinance, which was established in 1978 and stipulates that 1.33% of the cost of constructing or renovating public buildings will be used for public art. What an amazing concept. Go Chicago! There will be many special exhibits and tours, but I was only in Chicago for 3 days this April, so could only track down a few of these special art works at this time. So…to start with Picasso’s “Untitled”. “Untitled” by Pablo Picasso, on the Richard J Daley Civic Center Plaza, 50 W. Washington Street. In 1967 Pablo Picasso’s monumental sculpture was unveiled in Chicago’s Civic Center (now called the Richard J. Daley CivicCenter). In 1963, imagining a work for the new Chicago Civic Plaza, architect William Hartmann of Skidmore, Owings and Merrill turned to Pablo Picasso. Using an introduction from English artist Roland Penrose, Hartmann contacted Picasso describing a “site for the most important piece of sculpture in the United States.” Picasso accepted and worked on plans for the largest work of his career, mostly with his vision of an abstract female figure, which he gave as a gift to the city. 1967. In fact, as I learned from the small exhibit in the Chicago Cultural Center, many Chicagoans thought it was a giant portrait of the artist’s Afghan hound. An alderman from the City Council proposed replacing the Picasso with a giant statue of Chicago Cubs legend Ernie Banks, and a local paper ran a story with a photo of Banks superimposed on that of the Picasso. At the time of the opening of the Picasso, Mayor Richard J. Daley insightfully dedicated it with these words, “what is strange to us today will be familiar tomorrow.” That has proved true, and 50 years later it’s an iconic part of the city’s landscape, and much loved by locals and visitors. So much so, that Northwestern grad and vocal art advocate, Patricia Stratton, has written a book dedicated to the sculpture called “The Chicago Picasso: A Point of Departure”. I find this work of Picasso’s very interesting: I can definitely see the Afghan hound in there, but also a female figure. What do you think? Picasso’s work was Chicago’s first major pubic art work in the modern style, rather than historical effigies and memorials that had been traditional before. It inspired much private and public investment in art for the city center, including Marc Chagall’s mosaic “The Four Seasons” in 1974, which then inspired his “America Windows”. Other commissions included monuments by Joan Miro (1963), Jean Dubuffet (1969) and Alexander Calder (1974), among many others. And so a tradition was born. 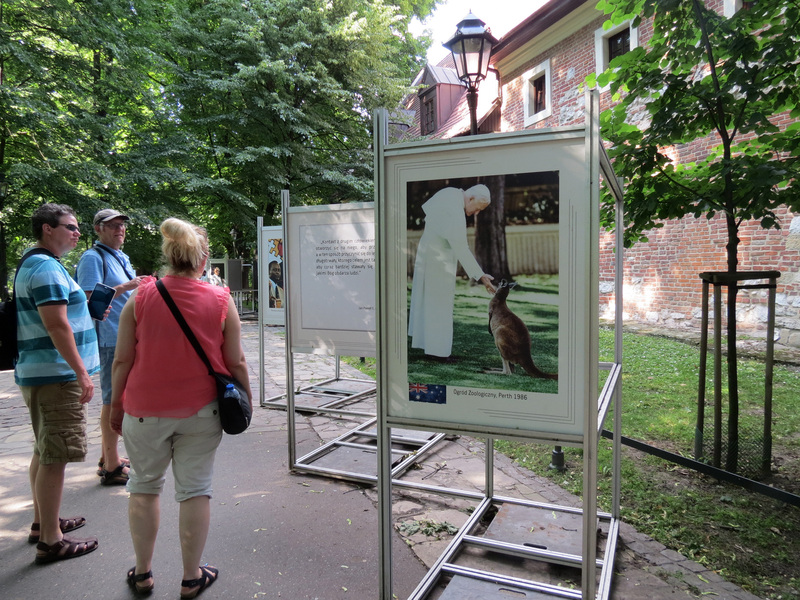 Many cities have, over the years, put up an outdoor exhibition of “Animals on Parade”. 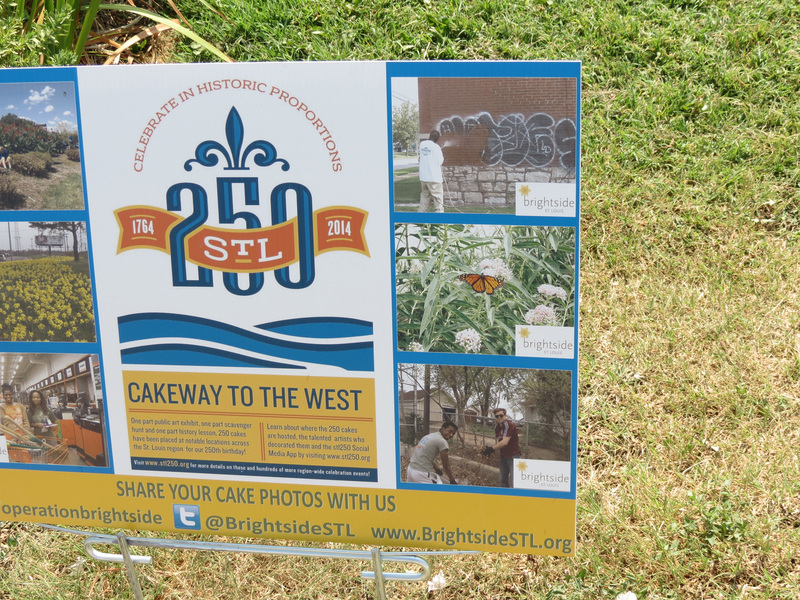 The city chooses a special animal—horse, cow, pig, buffalo—and many of these animals are made in fiber glass. Different companies, businesses, shops, institutions adopt an animal and paint it any way they want—usually somehow reflecting their business—and it is placed outside. Some are bright and cheerful, some very whimsical, some symbolic, some rather strange. 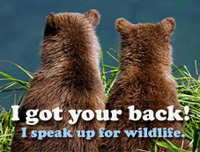 After some months, there is usually an auction and the animals are sold to benefit a charity. Sometimes the business will keep its own animal, but sometimes it goes to a new home. 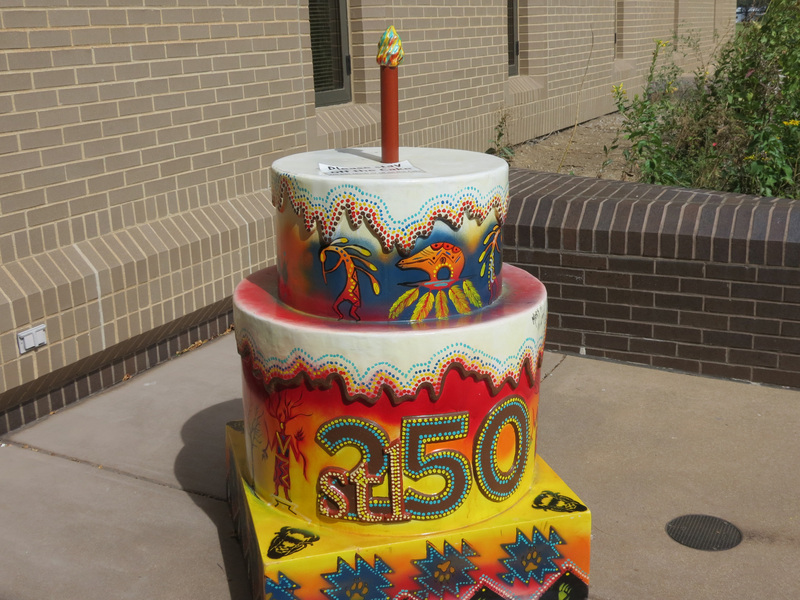 years celebration with 250 fiber-glass cakes dotted around the city. Same great concept. We’ve seen a number of these collections on our travels and it’s a lot of fun, especially if there’s a list and you can try to track down all of them. Visitors and locals all love these, and it obviously benefits the city to have this extra interest in a temporary exhibition of wonderful outdoor sculptures. The first “parade” that we came across was the “Cows on Parade” in Chicago in summer 1999 and I wrote about that then. 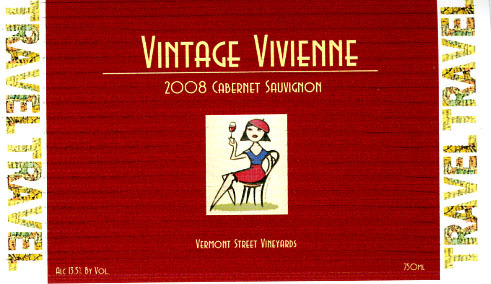 See here http://www.viviennemackie.com/Illinois/Chic-cow-go.html . In summer of 2002 we saw the “Buffaloes on Parade” in Salt Lake City and nearby Antelope Island in the Great Salt Lake. And the following year we found many of the “Lipizzaners on Parade” in Vienna, Austria. All gorgeous. So….walking around my own neighborhood in Urbanathe other day I was intrigued to find a painted fiber-glass horse in someone’s garden. It’s very pretty with a black and white pattern, but its stance didn’t match any of the “parades” that I’ve seen. I’m very curious—-where did they get it, what does it represent? I don’t know these people at all, so I may never know. But, I’ll be sure to walk that way again. I posted this on my blog about our special Eastern Europe Trip, but think it’s also relevant and interesting here. So, here’s the link. Enjoy! 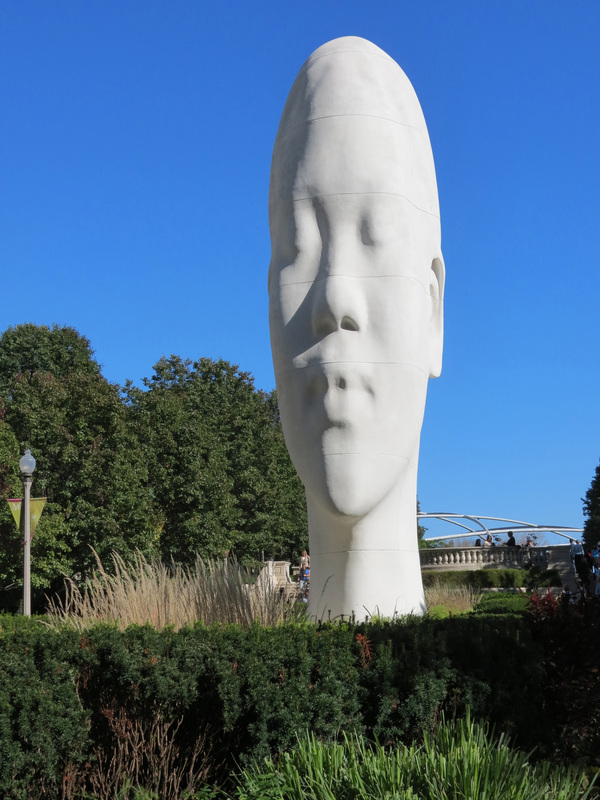 In celebration of its 10th anniversary (opened 2004), Millennium Park in Chicago presents an exhibition of sculpture by Jaume Plensa. 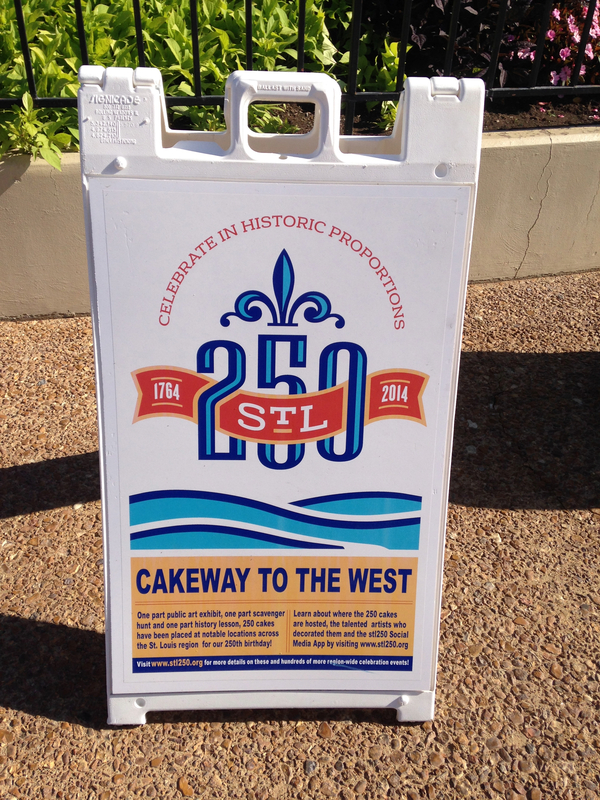 On display through December 2015. Because we’d seen Nomade recently we were happy to find more works by this talented artist. 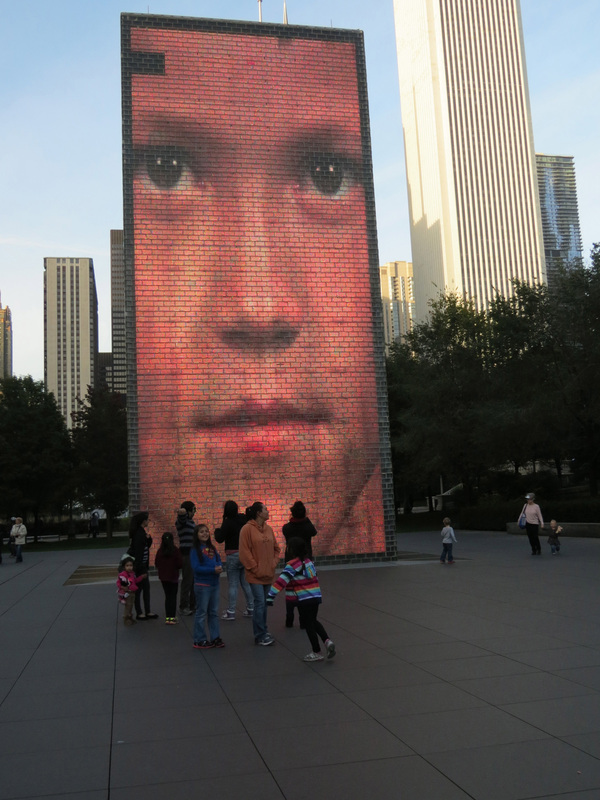 Chicagoans are already familiar with Plensa as he designed and made the Crown Fountain at Millennium Park, one of the park’s most prominent and popular attractions. The fountain, which opened in July 2004, is composed of a black granite reflecting pool placed between a pair of glass brick towers. The towers are 50 feet (15 m) tall and they use light-emitting diodes (LEDs) to display digital videos on the faces that appear and disappear. 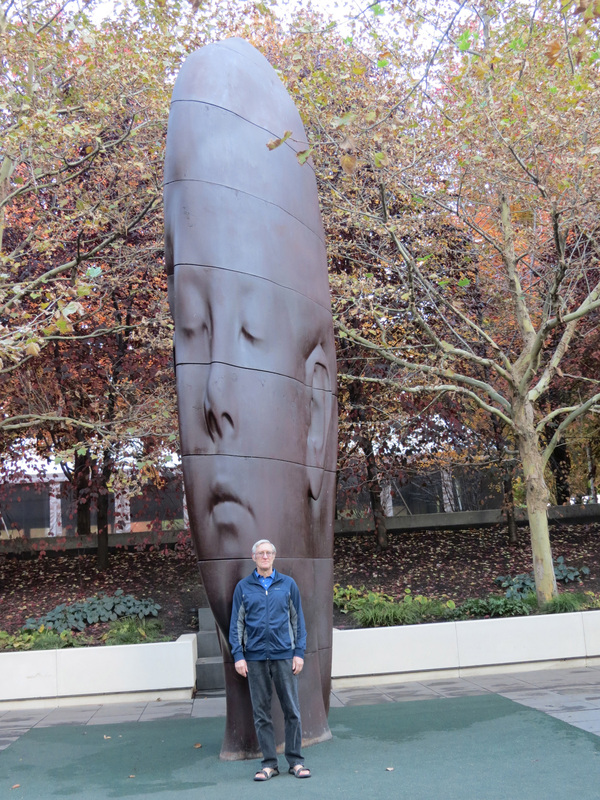 Now, he has another installation in Millennium Park—4 huge heads, called 1004 Portraits, on display through December 2015. 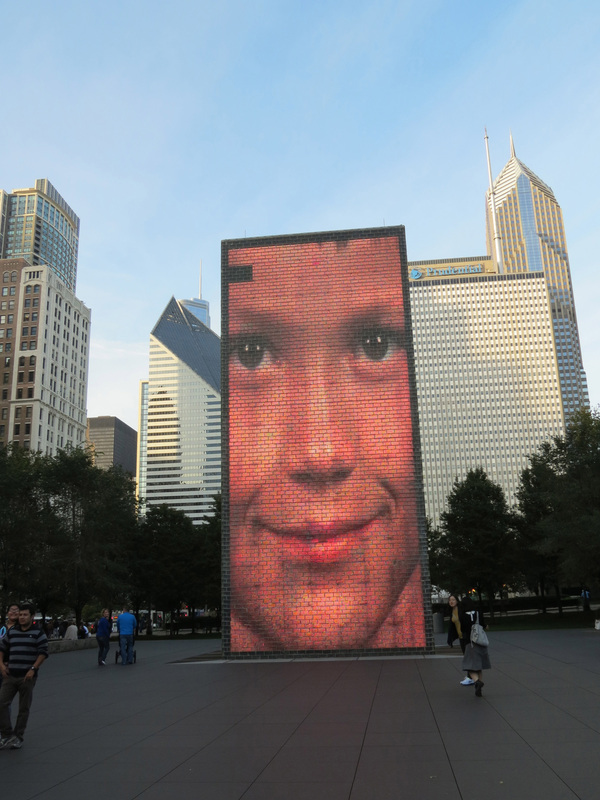 This new exhibition of outdoor art features four monumental portraits of young girls complementing the story of the 1000 LED portraits of Chicago residents that illuminate the Crown Fountain. The first sculpture is called Looking Into My Dreams, Awilda. It’s made of resin and marble dust and stands 39 feet tall at the entrance to the Park on Michigan Ave and Madison Street. The aim is that the sculpture’s surreal and majestic presence will bridge the energy and distractions of city life with the tranquility of the Park, and encourage visitors to stop and contemplate. The other 3 sculptures are in the South Boeing Gallery, overlooking the fountains. 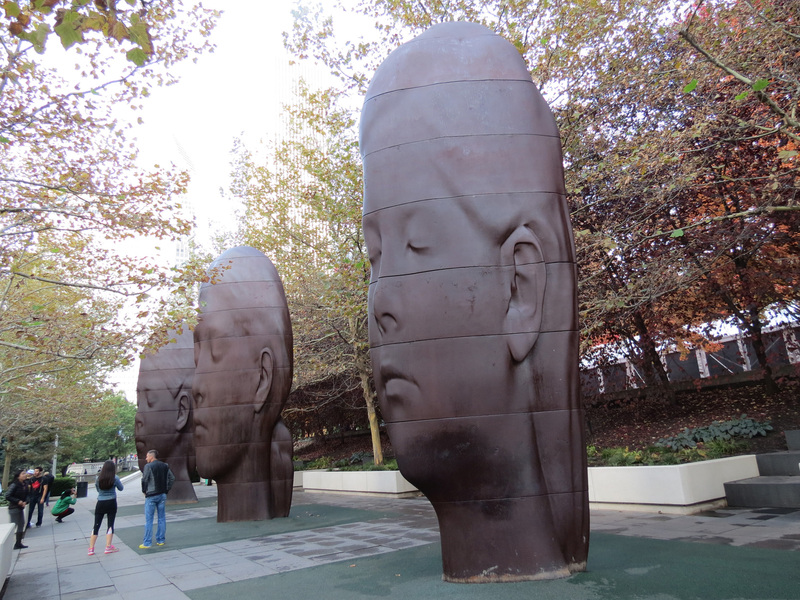 They are cast iron and stand 20 feet tall—Paula (north), Laura (middle) and Ines (south). They are very solid-looking but also have a hologram-like quality. These serene, dreamlike portraits offer a counterbalance to the children’s noisy play in the fountains below (in the warmer weather). This exhibition is on loan from the artist and Richard Gray Gallery and is sponsored and funded by multiple sources.